Dog heart worms are common and potentially life threatening. Heartworm signs are difficult to detect, allowing the heartworms to move through their life cycle and grow inside the dog causing heart and lung problems. Because of this veterinarians recommend that preventatives are used to avoid this problem. They are recommended 1x per month during the mosquito season. It is difficult to detect when it does occur. If an owner suspects the presence of heartworm, they should visit a veterinarian for confirmatory laboratory tests as soon as possible. .A parasitic worm (nematodes or Dirofilaria immitis), has been confirmed as the cause of dog heart worms disease. This is intermediated by a mosquito vector (how the disease spreads). It is believed that over seventy (70) species of mosquitoes can transmit this parasite. 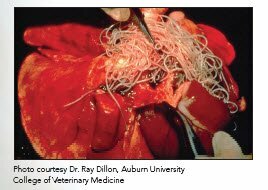 The term “heartworm” is used when referring to the adult form of the parasite; which is found in the right ventricle of a dog’s heart. Heartworm Life cycle: Mosquitoes can act as a “biological vector” for causative parasites, acquired from infected animals. In other words, mosquitoes spread heartworm from dog to dog. A Parasite completes its non-infective and infective larval stages in mosquitoes; which are then transmitted to a healthy dog when a mosquito is feeding on a dog's blood. It takes at least 2 months for the larva to become an adult and then move through the blood to the pulmonary arteries and then to the right ventricle. Adult parasites range 15– 25 cm in size (2 to 10 inches). The Onset of clinical signs is usually observed 6–7 months after infection. The heart worms can reproduce in the dog's body if both a male and female worm were injected into the dog by the mosquito. As the worms grow, the block the flow of blood through the heart and possibly to the lungs. Since blood carries oxygen, the lungs work harder when they become oxygen deprived. The impact on the body can be congestive heart failure. It is very difficult to determine if a dog heartworms are a problem as it takes months before canine heartworm symptoms appear. Signs of heartworm fluctuate, meaning that a dog may or may not show signs of dog heartworms, depending upon the breed, age and burden of the heartworms on a dog's physiology (condition). Dogs that are between the ages of 3–8 years, that live or work outdoors are most susceptible. Clinical dog heartworm symptoms include coughing, intolerance to exercise and running, exhaustion and the sputum flooding with blood while coughing. In advanced cases, progressive weight loss and severe respiratory involvement should also be noted. Serological tests are the preferred method for making a diagnosis instead of clinical signs, as a canine patients infection can persist for almost 6–8 months before a dog shows clinical signs of heartworm. Serological tests are used to detect the presence of an antibody–antigen relation that indicates that dog heartworm is present. This test can detect a problem even before onset of mild clinical signs. Different tests like ELISA, IFA etc. are preferred. Thoracic radiography (x-rays) can help in screening only, but can never be a confirmatory tool for the presence of dog heartworms. Other procedures like a Knott’s test and Filter Test too are used as screening tools. Only serological tests can help in identify dog heart worms and the related antigen or antibody circulation in blood. A clinical history, examination and most of all laboratory confirmation are used to determine the severity and possible outcome of disease. Based on these results, a , veterinarian will define a treatment plan. A Veterinarian has to go through various clinical and laboratory procedures before he/she can prescribe treatment options for any case of dog heart worms. Milarsomine dihydrochloride is a heartworm adulticide and is considered to be the most effective approach for the elimination of both mature and immature dog heart worms. Injections containing doses of 2.5 mg/Kg B.W is administered intramuscular, deep into the lumbar muscles with a special 22G needle. An Injection is usually repeated after 24 hours. Dogs may experience severe pain, swelling and soreness after injection. In severe cases of dog heart worm disease, where the worms cause a pulmonary blockage, after initial doses, the injections are repeated after 1–2 months, with 2–4 doses administered 24 hours apart. Exercise should be strictly prohibited for at least 4–6 weeks after the administration of the melarsomine injection, otherwise severe reactions can result into pulmonary complications; which are hard to control. As prophylaxis and preventive safety, a mild dose of ivermectin is always recommended 1–6 months prior to the administration of melarsomine, if clinical manifestation does not conclude with immediate administration of melarsomine. 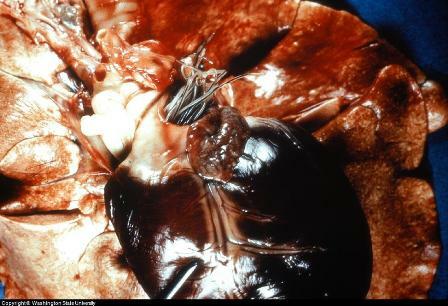 Ivermectin will reduce the chance of pulmonary thrombosis or complications of dog heart worms. Every dog should be on a 1x a month heart worm preventative during mosquito season. Before providing a prescription refill, veterinarians will retest dogs to ensure that they haven't developed dog heart worms, even if they are on the medication. This is because a dog may have spit out a tablet, an owner could forget to give it to a dog, or travel to a warm weather region could result in transmission. If a dog is given a preventative when they have dog heartworms, killing the worms at once could result in health problems for the dog. Also, different dog heartworm medicines are used depending if a heartworm is in the larvae or adult stage. Heartgard Plus: also protects against roundworms and hookworms. worms). Comes in tablet form. Interceptor: Also helps prevent hookworm, roundworm and dog whipworm. Comes in tablet form. Sentinel: also helps to prevent fleas. Tablet form. Revolution: Known as a spot-on (topical) which is applied to the back. Also kills and prevents fleas, ticks and canine mange. Proheart 6: This is an injection provided to a dog 1x every 6 months instead of the other products which require a pill every month. It does not protect against other parasites such as worm. There is also a homeopathic product available that could provide an extra added level of support, although it is no substitute for a preventative such as the products listed above. If interested in this approach, Parasite Dr. Capsules , contains natural ingredients that help a dogs body expel parasites such as canine heartworm, roundworm and tape worm.